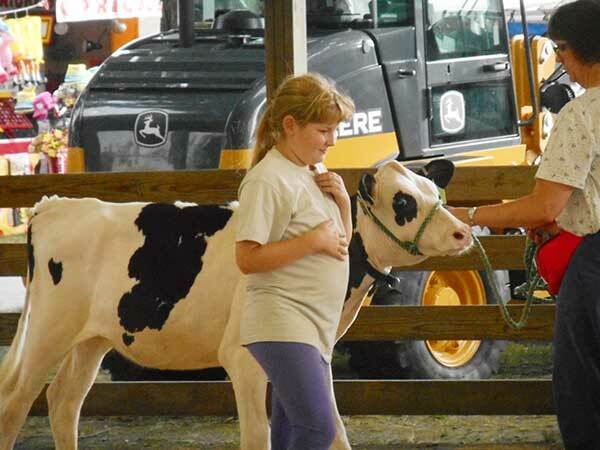 The fair is alive with animals of all shapes and sizes. You’re sure to enjoy watching the best of the best walk off with cash prizes and blue ribbons in the Show Ring. Check out the competition ring or meander through the barns to view other fine two- and four-legged animals. A partial listing follows. From Ayrshires to Milking Shorthorns, from Guernseys to Brown Swiss, the region’s dairy cattle draw admiring glances. From Angus to Herefords, from Shorthorn to Simmental, the region’s best beef cattle vie to win the championship. Two dozen breeds, from the better known Shetland and Merino to the more exotic Tunis and Ramboullet, fill the sheep pens. Open to more than 140 varieties, the poultry exhibit offers 15 sections of some very exotic looking birds: American, Mediterranean, Asiatic, English, French, Dutch, Game Bantams, Ornamental Bantams, Guineas, Ducks, Geese, Pigeons, and more.